As much as 90 percent of Lake Okeechobee — one of the largest lakes in the U.S. — is covered with algae. The Everglades Foundation in South Florida where the lake is located decided to create a contest with a prize of $10 million for whomever develops a technology that cheaply removes phosphorus, the main culprit in algae blooms, from freshwater bodies. 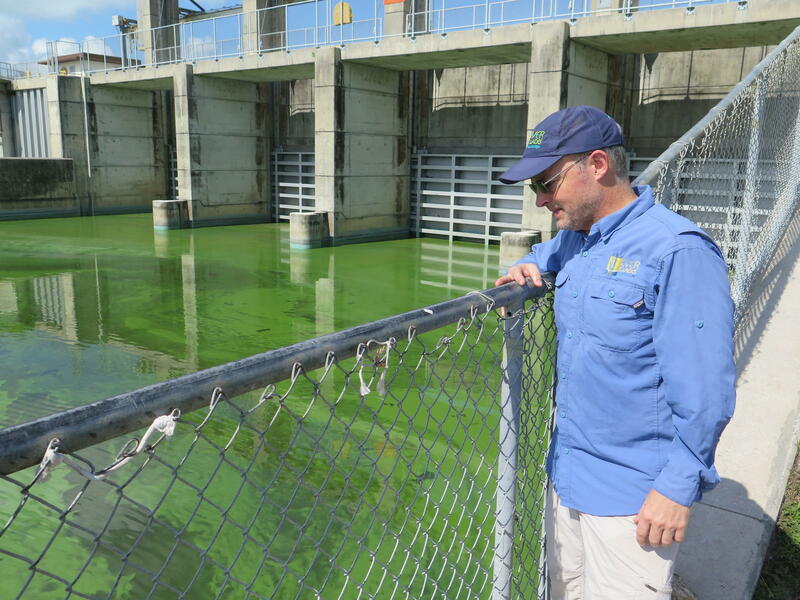 At this lock, which connects Lake Okeechobee with the St. Lucie River, everything is coated in green. Steve Davis, a senior ecologist with the Everglades Foundation, was surprised. Lake Okeechobee is the source of much of the water that flows south through the Everglades. A recent NASA photo showed that this summer, as much as 90 percent of the lake's surface was covered with algae. At this lock, connecting the lake with the St. Lucie River, everything is coated in green. "It's a pretty dense mat of, I would bet, microcystis blue-green algae," Davis says. "It looks like a paint truck crashed and spilled green paint all over the surface." The algae have a strong smell that can irritate eyes and throats. Even worse, it can be toxic. Two years ago, algae flowing down the St. Lucie River from the lake forced the closure of beaches during the normally-packed July 4 holiday. Algal blooms have long been a headache in Lake Okeechobee. For decades, nutrient-rich runoff from cattle ranches, farms, and sugar plantations has flowed into the lake. 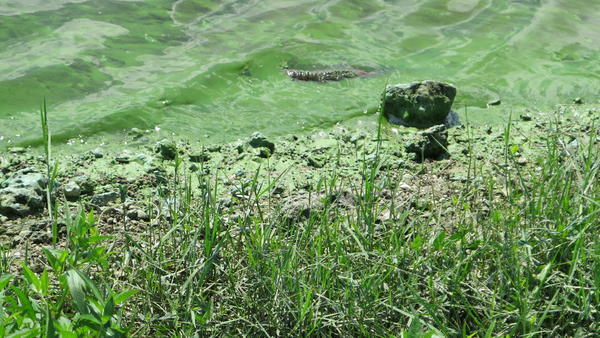 "So that's really deposited a layer of phosphorus-rich muck on the bottom of the lake that in combination with the polluted surface waters makes for ripe conditions, especially this time of year for algae," Davis says. From China to Kenya to Canada, when the weather turns warm, mats of bright green algae form in rivers and lakes, hurting local economies, causing fish kills and endangering water supplies. Phosphorus-rich runoff from farms, cities and suburbs have made algal blooms a perennial problem. The Everglades Foundation in South Florida, decided to tackle it head-on. "We thought that this phosphorus is such a big challenge, the phosphorus problem, that it would deserve a $10 million prize," says Chief Scientist Melodie Naja. It's called The George Barley Water prize, named for one of the Everglades Foundation's founders. Naja says the goal is to develop an efficient, cost-effective technology for removing phosphorus from freshwater bodies. "We want this technology to be affordable, to be cheap," she says. "That all states, all developing and developed countries could use it to clean their pollution." Currently, removing phosphorus from polluted water takes time and a lot of real estate. In South Florida, large, shallow reservoirs covering nearly 60,000 acres are used to treat just a small portion of the water that flows out of Lake Okeechobee. The companies, universities and research groups taking part in the competition are testing technologies to remove the phosphorus from the entire lake — nearly a trillion gallons of water. "You know, if you want to do Lake Okeechobee, you can do it," says Koos Baas, a chemical engineer who has done the calculations. Baas is with Green Water Solution, a company based in South Florida and one of nine teams competing for the $10 million Barley Water prize. His and the other teams recently wrapped up the third round of the competition in Ontario, Canada. They're being tested on their ability to scrub phosphorus from freshwater down to 10 parts per billion — an extremely low level. Baas' company's technology is already being used in Europe to remove phosphorus from water used in cooling systems. He's confident it can be scaled up for use in large water treatment plants that could be installed at places where rivers and streams flow into the lake. "You can actually put an installation on a dike, so before it enters Lake Okeechobee, you can grab it there and treat it there," he says. Loren Parra with the Everglades Foundation says the goal of the competition is to develop technologies that could be marketed around the world as a cost-effective solution to a growing problem. "We've already seen really great progress in the nine teams that we have," Parra says. "So, we're really excited looking forward to grand challenge and we're certainly hoping that one of these guys can change the world." The winners of the current round will be announced in October. The final phase — the grand challenge with its $10 million prize — gets underway in 2020. Summertime brings algae blooms to many parts of the country - those mats of bright green organisms that can blanket waterways. In places like Florida's Lake Okeechobee, the blooms hurt tourism. They kill fish. They threaten water supplies. But a solution may be on the horizon. From Miami, NPR's Greg Allen reports. GREG ALLEN, BYLINE: Shells from freshwater mussels line the shores of Lake Okeechobee. This is one of the largest lakes in the U.S., in the center of the Florida peninsula. But it has a nagging problem. Nearly every year now, large algae blooms blanket the lake. STEVE DAVIS: Oh, my gosh. Look how thick this blue-green mat is right here. ALLEN: Steve Davis is a senior ecologist with the Everglades Foundation. Lake Okeechobee is the source of much of the water that flows south through the Everglades. At this lock connecting the lake with the St. Lucie River, everything is coated in green. DAVIS: It's a pretty dense mat of - I would bet - Microcystis blue-green algae. Looks like a paint truck, you know, crashed and spilled green paint all over the surface. ALLEN: The algae have a strong smell that can irritate eyes and throats. Even worse, it can be toxic. Two years ago, algae flowing down the St. Lucie River forced the closure of beaches during the packed July Fourth holiday. From China to Kenya to Canada, phosphorus-rich runoff from farms, cities and suburbs have made algal blooms a perennial problem. The Everglades Foundation in South Florida decided to tackle it head-on. MELODIE NAJA: We thought that this phosphorus is such a big challenge - the phosphorus problem - that it would deserve a $10 million prize. ALLEN: It's called the Barley Water Prize, named for one of the Everglades Foundation's founders. Chief scientist Melodie Naja says the goal was to develop an efficient, cost-effective technology to remove phosphorus from freshwater bodies. NAJA: We want this technology to be affordable, to be cheap, that all states, all developing and developed countries, could use it to clean their pollution. ALLEN: Currently, removing phosphorus from polluted water takes time and a lot of real estate. In South Florida, large, shallow reservoirs covering nearly 60,000 acres are used to treat just a small portion of the water that flows out of Lake Okeechobee. The companies, universities and research groups taking part in the competition are testing technologies to remove the phosphorous from the entire lake, nearly a trillion gallons of water. KOOS BAAS: Do you know - if you want to do Lake Okeechobee, like you just suggested, you can do it. ALLEN: Koos Baas is a chemical engineer with Green Water Solution, a company based in South Florida and one of nine teams competing for the $10 million Barley Prize. His and the other teams recently wrapped up the third round of the competition in Canada. They're being tested on their ability to scrub phosphorus from freshwater. Baas' company's technology is already being used in Europe to remove phosphorus from water used in cooling systems. He's confident it can be scaled up for use in large water treatment plants where rivers and streams flow into the lake. BAAS: You can actually put an installation on a dike. So before it enters Lake Okeechobee, you can grab it there and treat it there. ALLEN: Loren Parra with the Everglades Foundation says the goal of the competition is to develop technologies that could be marketed around the world as a cheap solution to a growing problem. She says some of the teams are close. LOREN PARRA: We've already seen really great progress in the nine teams that we have. So we're really excited, looking forward to Grand Challenge, and we're certainly hoping that one of these guys can change the world. ALLEN: The winners of the current round will be announced in October. The final phase, the Grand Challenge with its $10 million prize, gets underway in 2020. Greg Allen, NPR News, Miami. Transcript provided by NPR, Copyright NPR.